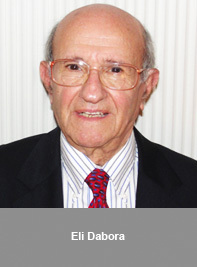 The School of Engineering community mourns the loss of professor emeritus Eli Dabora, who passed away November 8, 2013. Dr. Dabora joined UConn in 1968 as a professor of Aerospace Engineering and, later , Mechanical Engineering. With expertise in high speed combustion for propulsion, Dr. Dabora brought considerable knowhow in the combustion characteristics of fuels. He was particularly interested in understanding the science of detonation, how to initiate or suppress it, and its possible application to propulsion. During his years at UConn, he was admired and loved by his colleagues. Dr. Dabora earned his B.S. and M.S. degrees at MIT, and his Ph.D. from the University of Michigan, where he taught for five years before coming to UConn. Please read more about Eli’s career here and view his obituary here. Those who wish to share memories of Eli on his guest book may visit www.potterfuneralhome.com. A memorial service will be held in late December; the family requests that donations be made in lieu of flowers, to Windham Community Memorial Hospital, Willimantic, CT 06226.